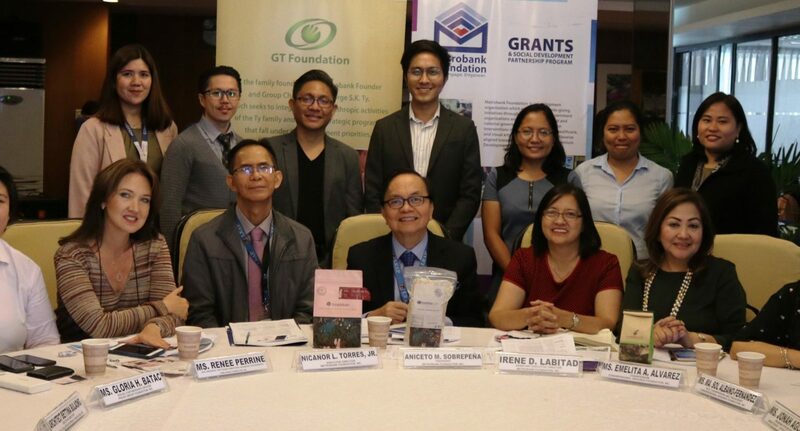 The Metrobank Foundation, Inc. (MBFI) conducted the 35th annual Grants Roundtable on April 20 at the Metrobank Plaza in Makati City. With the theme “How to Catch a Fish: Exploring the Different Faces of Entrepreneurship,” six (6) organizations shared the impact, lessons learned, and best practices in their projects which were supported by MBFI. This year, the event focused on livelihood, one of the Foundation’s priority thrusts as captured in the acronym HEAL — health, education, arts, and livelihood. Together with the United Nations Sustainable Development Goals (SDGs), HEAL serves as the framework for the Foundations’ collaborative partnerships that work towards nation building. The participants this year are: Escuela Taller de Filipinas Foundation; Hineleban Foundation; Congressional Spouses Foundation, Inc. (CSFI); Philex Group Foundation; Angat Buhay—Office of the Vice President; and Kalsada Coffee Roasters. In alignment with SDG 1 (‘No Poverty’) and SDG 2 (‘Zero Hunger’), their MBFI-supported projects aimed at providing underprivileged families with opportunities to break away from the cycle of long-term poverty and become self-sustaining. Recognizing the power of the arts to inspire creativity and empower communities, MBFI supported Escuela Taller’s Business Incubator Program (BIP) catering to out-of-school youth. They are taught in thedevelopment of unique product designs in the areas of woodworks, masonry, metal works, electrical, plumbing and painting. They are also trained to become future entrepreneurs and apply learned-skills to establish viable business models. Three (3) of the organizations present during the event—Hineleban Foundation, Philex Group Foundation, and Kalsada Coffee Roasters—work with coffee farmers. Hineleban Foundation employs a comprehensive end-to-end farm development program for Bukidnon’s Indigenous Peoples (IPs). MBFI supported the conduct of a series of training on growing quality coffee plants, values formation, environmental protection, and financial literacy. Hineleban also supports these coffee farmers in the processing and marketing of their produce. For its part, Philex Group Foundation focuses on highland agriculture in the municipalities of Tuba and Itogon in Benguet. MBFI supported their Coffee Farm Rehabilitation Program, wherein farmers are trained to turn coffee trees in their properties into a viable source of income. The goal is to increase the harvest yield of coffee trees, connect farmers to sustainable markets, and empower them to provide for their families. Kalsada Coffee Roasters, on the other hand, helps communities reach the global specialty coffee market through consolidating their harvest and processing their coffee collectively. In partnership with MBFI, they conducted training programs on the growing and processing methods, financial literacy, and ensuring quality control. MBFI also works with the public sector, as seen in its collaborations with CSFI and Angat Buhay—Office of the Vice President. To complement the legislative mandate of the House of Representatives, CSFI organizes the annual Kabuhayan Expo with support from MBFI. The trade and travel fair promotes the products and tourism potential of the country’s various provinces and congressional districts. In addition, proceeds from the event fund CSFI’s livelihood and literacy programs for female inmates. Angat Buhay—Office of the Vice President, on the other hand, worked with MBFI in the procurement of additional materials and equipment for the women weavers of Marawi City. The goal is to help establish traditional weaving as an alternative source of income for marginalized sectors, while protecting the cultural heritage of the area. Established in 1979, MBFI, through its Grants Program, continues to forge more partnerships with like-minded organizations who share in its mission of helping heal the Filipino one grant at a time.